Do You Recommend Strontium Citrate for Osteoporosis? 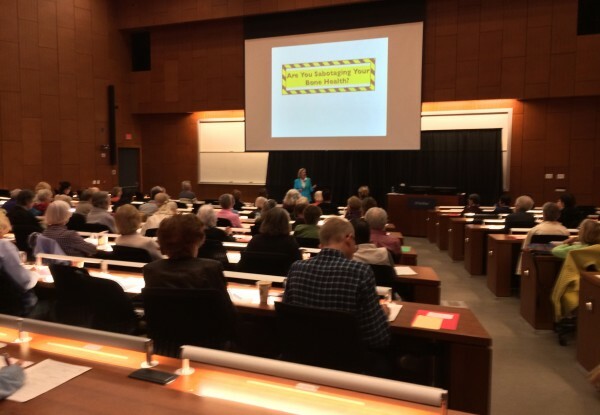 This past weekend, I had the opportunity to speak at UC San Diego’s Stein Institute for Research on Aging event on bone health. Participants submitted questions at the end my talk entitled, Are You Sabotaging Your Bone Health? Since I was unable to answer all the questions, I will use those questions both answered and unanswered for the Q&A entries over the next several months. Do you recommend strontium citrate supplements for those with osteoporosis? The answer is no, because there is no evidence for this compound for safety or effectiveness in prevention or treatment of osteoporosis. Strontium citrate has not been evaluated systematically in clinical trials for fracture reduction. Strontium is a naturally occurring mineral (element number 38 on the periodic table you may have studied in chemistry). Your body naturally contains about 320 mg of strontium, most of which is in bone. Strontium is obtained primarily through diet with an average daily intake of approximately 1 to 5 mg. Strontium can replace calcium in some of its biochemical processes because of the similarity between the two elements: like calcium, strontium has two positive charges. In the bone, strontium is incorporated into the bone mineral and retained in your skeleton. Strontium for medicines is combined with various salts for use. The compound strontium ranelate is available in other countries for treatment of osteoporosis. It is not approved for use in the US. However, over-the-counter supplements containing the salt strontium citrate are available. Measuring changes in bone density with use of any strontium salts on our current standard, DXA, is fraught with problems. Strontium is denser than calcium. Therefore, much of the bone density increase is technical artifact due to the replacement of some calcium with strontium. Complex mathematical formulas have been derived to adjust the DXA bone density measurements. In general, the error in DXA measurement is estimated at 10 percent above the “real” bone density. If you are using strontium citrate or strontium ranelate, be sure to find a DXA center that knows how to adjust your bone density measurement for the presence of strontium. In the meantime, we are awaiting the final word from the European equivalent of our FDA regarding removing strontium ranelate from their market. Heart problems, blood clots, and more risks were found to outweigh the modest benefit of fracture reduction with use of strontium ranelate. If you are taking any form of strontium talk with your doctor about your individual risks. Long term action in bone of strontium remains unanswered. The question of strotium toxicity has been raised. This concern is based on reports in the literature that high strontium levels cause detrimental effects in bone such as rickets and osteomalacia (soft bones).